Our Funarena! : Anna Gives It To The Indian People! This is the biggest victory for the Indian people since Independence. We never could see the live scenes of the Freedom Struggle except on celluloid. But now we are witnessing live the Second Independence. This time against a bigger enemy called 'Corruption'! We are privileged and proud of this moment thanks the Modern Day Gandhi, Anna Hazare. We are witnessing history unfolding right before us, incredibly vibrant scenes across India we never thought we could ever live to see. For the first time ever civil society will function together with the Government in a fifty-fifty partnership. The Joint Draft Committee will prepare the real Jan Lokpal Bill and it will be placed before the Parliament in its monsoon session by end of June this year. The Government had to accept all demands of Anna Hazare, supported by the whole of India, and predominantly, Young India. Tomorrow at 10.30am we have a date with History. Anna Hazare is set to formally end his fast unto death in acknowledgment of the Government notification. And, the first effective step to vanquish the blood sucking ENEMY will be underway. We are set too to cherish the moment of victory forever. Still, there are personified epitomes of negativity that refuse to be human and blabber out the disgusting 'Nothing will happen' (kuch nehi hoga!) things. Earlier today one specimen asked me 'Are you sure Anna is not corrupt?' Some desperate souls are on overtime to malign the Second Gandhi. Time now to laugh them off and better put them on the shelves. 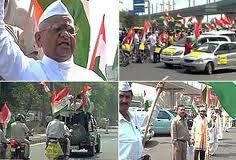 Long Live Anna Hazare. March the Anna Brigade! Demolish Corruption!